Straight Truck Series is applicable for all levels of truck drivers, from entry to veteran driver that operates any type of straight truck. It is a collection of training programs that emphasize the essential necessary skills for staying safe on the road. Help drivers understand the techniques that will help them prevent incident or accident while parking and backing straight trucks. It shows procedures to prevent collisions, including causes, preventative measures, overhead obstructions, and good parking and backing techniques. 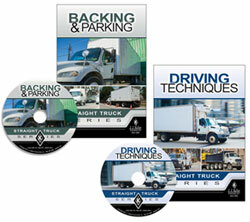 (1) 10-Minute DVD - Shows straight truck drivers critical skills for backing and parking. (10) Driver Handbooks - Product Code: 51265 = Serve as a post-training takeaway drivers can store in their truck and reference as needed. (1) Trainer Guide - Provides information on how to develop, organize, and conduct effective training sessions. (1) 10-Minute DVD -Shows straight truck drivers pro-level techniques for defensive driving and covers escape routes for common emergencies. (10) Driver Handbooks - Product Code: 51267 = Serve as a post-training takeaway drivers can store in their truck and reference as needed.